In a letter to West Virginia Delegate Larry D. Kump, Contractors Association of West Virginia Executive Director Mike Clowser wrote, "On behalf of the 475 members of the Contractors Association of West Virginia,...We appreciate the availability you always afford us to discuss the opportunities and the challenges of the construction industry in West Virginia.". For more information, contact: Mike Clowser at (304)342-1166 or cawv@cawv.org. MORGANTOWN, W.Va. -- West Virginia voters began filling out ballots across the state Wednesday as early voting got under way for the Nov. 6 general election. Footnote: 877 citizens voted on the first day of early voting in Berkeley County, West Virginia. Also, an important issue on the ballot is a proposed amendment to the West Virginia State Constitution, regarding whether or not to eliminate term limits for County Sheriffs. Early this morning,It pleased me to be the first early voter in Berkeley County again at the Berkeley County Voter Election Center in downtown Martinsburg, West Virginia. Even better, there was a long line of voters behind me, stretching out through the door of the Election Center. Early Voting in West Virginia will continue at County Election Centers throughout West Virginia from 9:00 AM - 5:00 PM, Wednesday, October 24th through Saturday, November 3rd (except for Sunday, October 28th). For those Mountaineers who prefer to wait and vote on election day (Tuesday, November 6th), you can confirm your election day polling place by visiting www.wvsos.com. Elections matter, and every vote really does count. Postscript: 877 citizens participated in the first day of early voting in Berkeley County, West Virginia. Another important issue on the West Virginia ballot this year is a proposed amendment to the West Virginia State Constitution, regarding whether or not there should be term limits for County Sheriffs. West Virginia Chamber of Commerce President Stephen G. Roberts has announced that the West Virginia Chamber of Commerce Political Action Committee has endorsed the re-election of Delegate Larry D. Kump to the West Virginia House of Delegates. In a letter to Delegate Kump, President Roberts told him that, "We believe you have a history of working hard to move West Virginia forward.". The West Virginia Hospital Political Action Committee (HOSPAC), "based on voting records for incumbent candidates and recommendations from member hospitals", has endorsed the re-election of Delegate Larry D. Kump to the West Virginia House of Delegates in the new district #59. Contact HOSPAC Treasurer Joe Letnaunchyn at (304) 353-9716 for further details. Building upon their belief that Delegate Larry D. Kump "will help advance the manufacturing legislative agenda to create more jobs and investment in West Virginia", the West Virginia Manufacturers Association (WVMA) has endorsed Kump's re-election to the West Virginia House of Delegates. For further information, contact: WVMA President Karen S. Price, (304) 342-2123. These days it is a rare, but professional, pleasure to support any candidate for political office in whom one has the utmost confidence. Not only am I fully satisfied with his legislative results, but his personal character (indeed his entire attitude toward life & political reality in our state) offer agreement, cooperation, & continuing success for all --including those special ideas which he offers so often & so innovatively himself. I can only wish there were more candidates in both parties I could support with the complete confidence. 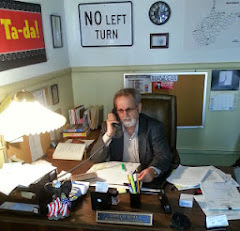 I take personal pleasure in adding my name to the lengthy & growing lists of individuals & solid organizations supporting my WV State Delegate, Larry D. Kump. Mountaineer bankers believe in Delegate Larry D. Kump and are urging his re-election to the West Virginia House of Delegates. Source: Joe Ellison, West Virginia Bankers Association Political Action Committee (WVBankPAC).